I always laugh at the often obscure names given to trails in our area. Some, I am sure have a backstory (Stick in the Nose is an actual trail name) while others I think are a lame attempt at sounding intimidating. But Crushers has always had that scary spot in my mind. Not just due to the name, but due to the massive boulder field that is the trail. 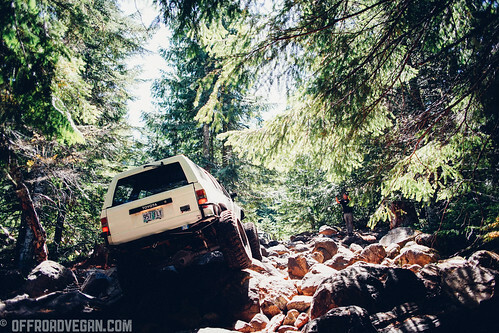 It is probably the ultimate rock crawling trail in this area. The trail begins with a common filter that has a pretty easy line even though it looks menacing. 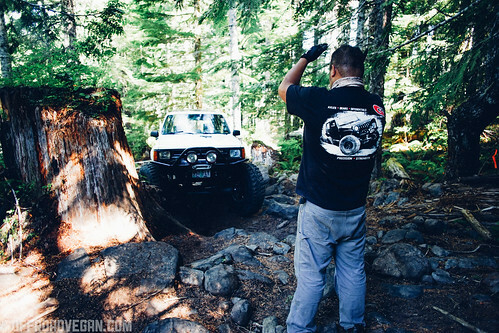 After the filter, the trail meanders through a short section of forest where tight trees and tippy rocks test the hard and soft tops of the crew. But with a little road building to offset the lean, we all came through unscathed (although I taco’d my tie rod pretty bad). Mike spots Matt through the last of the tight forest. Once out of the woods, the trail opens into a wide boulder field. It is pretty much open play, with no real determined trail. You will see above the exit from “upper crushers” and the trail for “lower crushers” clearly stays at the lower end of the boulder field. Vu tackling a nice line on lower crushers. This is a really great trail. I ended up turning around about mid way through though, as my tie rod was bent bad and I had very limited driver steering. I plan on going back soon though to finish the whole run. Duffy on an upper section of the boulders. A good spotter (read: experienced) is a must on Crushers, as is some good articulation and undercarriage armor. 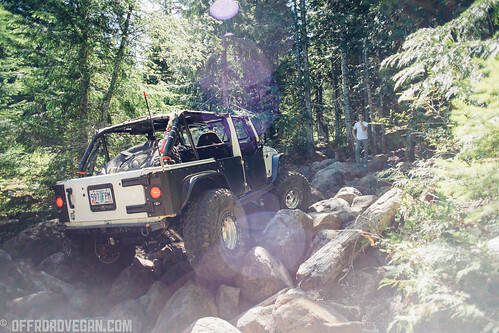 I would also highly recommend a winch and good recovery gear.